What began as a nationalistic pride walk devolved into a bitter public political feud between parade-goers and protesters last week on New Paltz Main Street. On Oct. 21, a flag appreciation walk met outside of LaBella Pizza Bistro, where flag supporters and counter protesters crowded Main Street from noon to 2 p.m. The parade was intended to unite community members who wanted to show love for their country but ended up invoking a protest, demonstrating a serious divide regarding the American flag and its meaning within the New Paltz community. 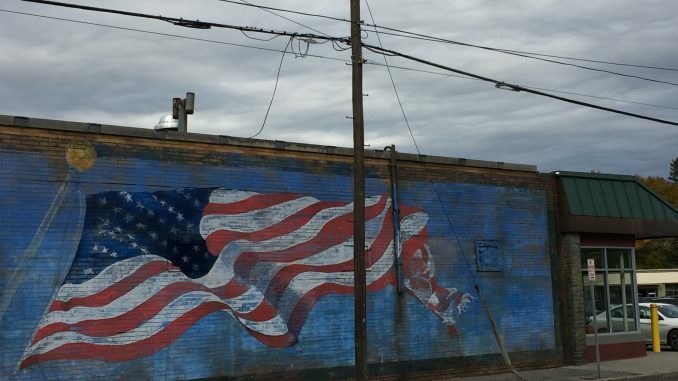 Event organizer Joey Garcia created the event because he noticed a strong opposition to the American flag mural soon to be painted on the side of LaBella Pizza Bistro. Garcia hoped that this event would attract people from all backgrounds to unite in support of the flag; however, the walk created a division in the community. Garcia intended for his event to be a peaceful demonstration of patriotism while excluding the discussion of politics. According to the Facebook event page, the walk was a fundraiser for LaBella Pizza Bistro’s American flag mural. Garcia also set rules and guidelines for the walk in the event details. He advised his participants not to bring political signs, be respectful of everyone and to not engage with those who may disagree with the event’s purpose. Garcia claimed it was important to celebrate the flag because it represents freedom, pride, strength and compassion. New Paltz resident Courtney Finigan attended the walk with family and friends, and said she had a overall good experience at the event. Fourth-year finance major Liam Neubauer counter protested at the walk on Sunday. Political tensions divided Main Street as verbal confrontation escalated throughout the demonstration. Some of the chants being screamed at the flag marchers included “f**k you Nazis,” “f**k the USA,” Q“f**k the KKK” and “f**k the racist police,” Finigan said. Neubauer recalled feeling terrified during the event, fearing for his physical safety and claims to have been threatened at one point. “The flag marchers were aggressive, I heard words like ‘freak’, fa***t, often,” Neubauer said. New Paltz resident and counter protester Daniella Medina said that she was born with amputated fingers and noticed rally participants mock her for her disability. “While holding my sign, two rally attendees noticed my fingers and made unmistakable ableist sounds and hand gestures toward me,” Medina said. The juxtaposing demonstrations revealed a dormant divide in the community, with residents’ values greatly differing.